Another very relaxed travel day, taking us up further north. 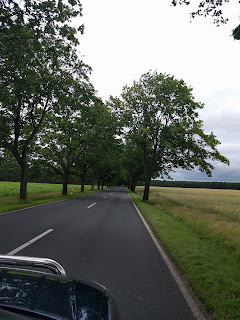 We left the camping at around nine in the morning, and headed back to the autobahn, where we pushed many kilometers before taking a smaller and cozier road very close to the one we came down on. We could actually wave to Olympiasee, it was just a few hundred meters behind the trees from us. 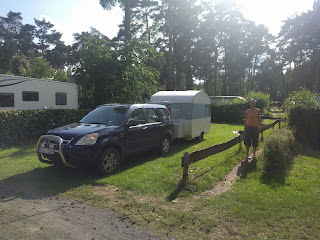 We found a nice camping, again by a lake, and arriving at 15 we had a few hours in the grass with our books before dinner time. Tomorrow we have about 3 hours left to Rostock, we haven't decided whether to go to a camping or just sleep in the dock to be close to the ferry on Thursday morning.